A retinal detachment is a condition that involves the retina separating from the supporting structures of the back of the eye. 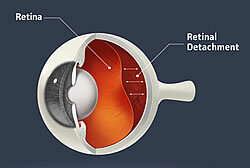 The most common cause of a retinal detachment is one or more small holes have been formed on the retina. The holes can form because of trauma, degenerations of the retina, or after an eye surgery. The eye fluid can enter the hole(s) and start to peel the retina off of the back of the eye. The symptoms of a retinal detachment may include the sudden development of floaters and flashes. Bleeding from a tear in the retina can cause the floaters, and the pulling from the vitreous gel on the retina can cause the flashes. If the retina starts to become detached, a patient may see a blurry image along the edge of their vision. As this progresses, the blurriness may enter the center. If the retina fully detaches, the macula also becomes detached, and the vision becomes rapidly worse. Patients experiencing these symptoms should see an eye doctor immediately. There are many treatment options available for retinal detachment. If the retina has only small tears, treatment with a laser can usually fix the tear and close monitoring will follow. If the retina becomes detached, an in-office procedure called pneumatic retinopexy may help reattach the retina. During this procedure, the retina is pushed back by injecting gas in the eye. Laser or cryotherapy (therapy by freezing a part of the retina) is then applied to reattach the retina. In other cases, surgical placement of a silicone band, called a scleral buckle, may be placed around the eye to help the retina become reattached. A vitrectomy, a surgical procedure where the vitreous gel is removed, may be needed to help repair the retina. A retinal detachment involving only the peripheral retina can be surgically repaired to maintain excellent vision. If the detachment has progressed to involve the center of vision, the macula, then some vision may be lost, even after surgical reattachment of the retina; thus retinal detachment requires immediate attention.